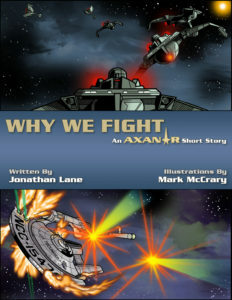 “WHY WE FIGHT” – the first-ever AXANAR illustrated short story! Read more about the creation of this original Axanar short story by clicking here. And come back next week for an interview with illustrator Mark McCrary. Congrats, Jonathan, on a great story!!!! Thanks, Catherine! It was a blast to work on! I dig it. Dovetails neatly into Prelude and a little bit of fan service as well. Jonathan, that is awesome work! 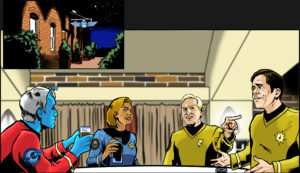 It deserves to be printed and available to all Trek fans. As far as I’m concerned, this is canon. Awesome! He didn’t say anything at the time — but at least he didn’t go “shush — I’m busy!” (which is his usual reaction when he’s interrupted in the midst of something). We’ve got the printout of the PDF, though, so he can look at it himself later on today when he’s not so busy. Nice to see this finally come to light! And kudos to McCrary for his excellent illustrations! Jonathan, did you consider re-writing this in prose? I thought it was well written. Reminded me of scripts from the original series. Well done to the author. The art work was outstanding, and complements the story well. Over all outstanding work! Many thanks from both of us, Wayland. Hey Jonathan – this is good. Expected prose, but dialog places its own special demands on the writing! Love the subtext, and you leave me keen for more. (Yes, and good graphics also.) Downloaded the PDF as I prefer this to reading from the screen – good layout too (naturally!). I immediately got the WWII “Why We Fight” nod. It was a fun story which fits very neatly into the Axanar timeline. Just awesome! Very cool! WE WANT MORE! WE WANT MORE! As for Daria, I’m not entirely sure Travis was her paternal great grandfather, but possibly. Yes, she’s his descendant, likely with at least one or two non-white progenitors in the mix between there and here because she needed to have blond hair. Why? Well, she will also soon become Daria Decker and leave Starfleet to raise their son, Will. Thank you :). And frankly I agree with D. C. Fontana that better is treating Trek universe as a multiverse without rigid canon… but… your method of continuity building I’m really like. Especially in the context of Discovery writers’ unconstraint. The fun part of playing in the Star Trek “sandbox” is that there’s a lot of toys there. And frankly, fan fiction can be anything we want it to be. Different universes/same universes. Who cares? If you like something in your “head canon,” it’s YOUR head canon, right? Many decades ago back in college, I had a girlfriend who wrote some Trek fan fiction. In one of her stories, Kirk is on shore leave and ends up having one of his typical “trysts” with a young woman who only tells him her first name: Joey. Kirk, in turns, plays the game and only tells her his first name: Jim. The two have a fun little fling, mostly harmless, until the Enterprise returns to pick up the crew who was on shore leave. Kirk is with Joey when someone rings the buzzer to her hotel room. She answers, not concerned that there’s a man in her room. She’s an adult, after all. Turns out the Enterprise got back early, and her father discovered that his daughter was vacationing down there and wanted to surprise her with a visit. Her father was, of course, Dr. Leonard “Bones” McCoy, and “Joey” was actually Joanna McCoy. She had no idea “Jim” was James T. Kirk, her father’s best friend. And…well, the fit hits the shan in a big way. Canon? Certainly not. Head canon? Possibly. While I enjoyed the story, and Kirk and Bones do make up at the end, it seems like the kind of wound that might go pretty deep in their friendship. So perhaps it didn’t really happen. Or perhaps it did. Or perhaps it’s just all in an alternate Trek universe. Heck, there was an early Trek novel called “Black Fire” where Spock spends six months as a space pirate. Canon? Head canon? How about just enjoying the book? And… it is really good to know that Travis’ descendant was/will be the captain of the Enterprise. Yeah, pretty cool to think about that! No, it’s my fault for starting this. My bad. I was just having some fun with it. Loved the story and graphics. Hope you guys do another in the future. And the new edit function is working as it should. Thanks for adding it Jonathan. BTW, there are extensions for WordPress that allow editing of comments. Just a suggestion. Editing how? Correcting other people’s typos? I can do that right now, but I usually choose not to. Ajax would be one example of plugin that allows editing. Don says he’ll be running/reblogging your story on both of his blogs on Monday, then. Thanks so much! Awesome! Please thank Don for me. You’re welcome, and Don appreciates the opportunity to share your work with the readers of his blogs! I’m always happy to expand my reader base, Catherine. It’s a very kind gesture by your husband and truly appreciated. There were multiple instances of names like Enterprise, Intrepid, Excalibur, Defiant, etc. throughout the 23rd and 24th centuries. 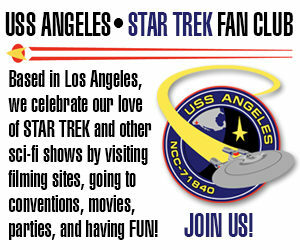 So just because a USS Tecumseh existed in 2245 doesn’t mean another USS Tecumseh can’t exist a century later, as well. The Tecumseh is from a class of ship whose names come from the great Native Americans throughout the history of the Unites States. (Yes, I totally grasp the heartbreaking irony in that last sentence.) We have already seen the USS Geronimo. There will also be vessels with names like the USS Cochise, USS Sitting Bull, USS Sacajawea, USS Pocahontas, and USS Squanto. Tecumseh was a Native American Shawnee warrior chief from what would later become Ohio who unified a number of Indian tribes to resist the American settlers. Originally, I had named the vessel the USS Armstrong. But Mark McCrary liked the class of ship that was the Geronimo and drew that. Alec recommended that we find a Native American name instead, and we both came up with Tecumseh.